In a bowl, combine seminola and chickpea flour, yogurt and enough water to make a smooth batter. Add ginger, green chile and turmeric to batter; mix well. Stir in salt and cover with lid. Heat water in steamer or large covered skillet with lid and low rack. Butter a baking dish (it should fit in the steamer or cooker). In small bowl, combine baking powder and baking soda, 1 teaspoon of oil and mix well. Add to the batter and mix well. Pour the batter into the greased pan and steam for 15 minutes or till done. Cool and cut into large cubes, set aside. Heat remaining 1 teaspoon oil in a small pan. 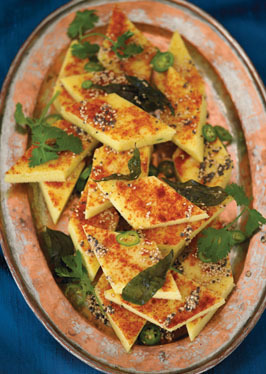 Add the sesame and mustard seeds and curry leaves, and quickly stirfry until lightly browned. Pour over dhoklas. Garnish with cilantro and sliced green chiles.